Consumers of the Premium Motors Spirit (PMS), best known as petrol, in Ondo State are groaning following a scarcity of the product, with one of them telling Saharareporters: "Honestly, I am tired of this country." Findings by SaharaReporters on Saturday showed that the scarcity has made many of the consumer to engage in panic buying of petrol in the few gas stations in the state capital, Akure, where the product is available. A SaharaReporters correspondent who moved round the state capital reported that the scarcity became noticeable late on Friday. The scarcity was visible in some of the gas stations visited, as their gates were shut while consumers of the product, mostly motorists, were stranded. 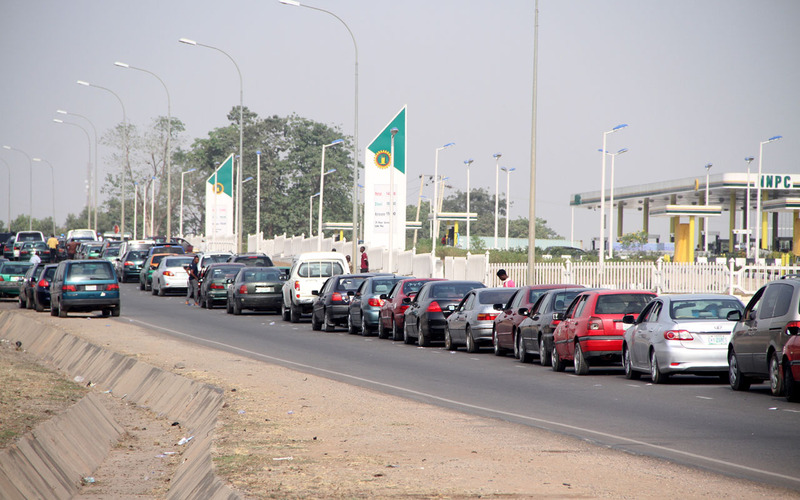 However, the few gas stations that sold — at Alagbaka, Oyemekun, Oke Ijebu, Ijapo, Ondo Road and Oda Road — experienced long queues in a stretch of about 200 to 300 metres, thereby causing traffic on the roads. Long queues were seen at NNPC Mega stations on the highway in Akure, as other gas stations on same route up to Shasha market were closes, aside the popular Showboy Petrol Station. The Bovas gas station, which is the most preferred choice of motorists on the Oke Ijebi route, shut its gate as workers said there was no fuel to dispense to consumers. Our reporter observed that these gas stations, which are mostly retailers, have started selling the product at N150 and N180 per litre, which is against Federal Government-approved pump price of N145. Investigations showed that the major marketers in the state that have the product are now rationing it on high price among Independent marketers willing to cooperate. It was also noticed that many of the motorists rushing to queue up for the product had no idea of the cause of the sudden scarcity, and the station's owners were unwilling to talk. A motorist, Tijani Olakunle, said the situation might worsen from Monday if the government refuses to intervane. He also accused the government of insincerity on the scarcity of the product. "They are telling us that there is fuel everywhere, thank God you said you are a journalist; can you see the product here now? At least you saw us in the queue sweating inside our vehicle to get the product. "I don't think the Federal Government is being sincere with this scarcity of fuel. How can they say there is fuel everywhere while we are suffering to get it here? So, I am calling on them to better act immediately before this scarcity will get worse by Monday becuase people will want to travel back and go to their places of work." Another petrol consumer, Babalola Orimolade, whose wife sells cold food inside the Oja Oba Market, said the scarcity is now bitting hard and will have a knock-on effect on their business. "We need petrol to power the generator to freeze the food inside our refrigerators, and I cannot even stand the queue at the gas station. You can see everyone sweating here to get the product. "Honestly, I am tired of this country — because it seems it is only we the common man that bears this brunt and those at the top don't feel what we are feeling. And is this the next level that they came to promise us. "Here, there is queue and they are selling for us at N150 per litre. If you cannot stand the queue, then you will get black market for N200 per litre. Is this not a big shame on us as country that has oil and still we refine outside the country?" Niyi Adesida, a commercial driver popularly known as 'taxi diver', said the long queues at the gas stations forced him to resort to getting the product from the black market. "The scarcity is already bitting hard on us as taxi drivers, and the N50 per drop is no longer comfortable for us becuase we now get the fuel at the rate of N180 and N200 per litre from the black market. "The filling stations are not openining for sale and I learnt they don't have the product, but where are the black market guys getting it from?" Shina Amoo, Chairman of the Independent Petroleum Marketers Association of Nigeria (IPMAN) in Ore depot, told SaharaReporters on the phone that the "slight" petrol scarcity was that the product was not readily available in the depots. Amoo explained that many of the independent marketers were now buying from private depots at an expensive rate to serve the state. He added that the Nigerian National Petroleum Corporation (NNPC) was aware of the situation and had been working to proffer solutions. "My brother, the truth of the matter is that the product is not available for consumption and we are getting the ones we have from the private depot," he said. "Just imagine, when we are buying the product to serve the people at the rate of N139 per litre, excluding other expenses of landing cost at the petrol station. But, like i told some persons not too long ago, everything boils down to the Federal Government to make petrol available. I hope this will be resolve before the end of next week." Speaking, the Operations Controller of the Department of Petroleum Resource (DPR) in Ondo state, Oseni Adewale, accused the marketers of hoarding the product against the consumers in the state. Adewale said there was enough petrol to last the state beyond the Easter season, noting that any of the markters caught hoarding the product will be dealt with it. Similarly, the Ondo State government has promised to arrest the owners of any gas station caught hoarding the product from consumers. A statement signed and issued by Doyin Odebowale read: "The Ondo State Government views, with grave concern, the latest attempt by some unscrupulous persons to create panic through the hoarding of PMS, fuel. "This assault on decency is coming at a time when the NNPC continues to reiterate facts on the availability of the product. Nigerians have been assured of regular supply of the product and this Government has no reason to disbelieve the organisation. "It is against this backdrop that the Government warns, sternly, all petrol dealers in the State, to desist from any unpatriotic acts which may inflict pains on the people. We, on our part, will resist and sanction any untoward practice, conceived and/or executed, to engender hardship in the Ondo State. Any dealer caught hoarding fuel will be arrested and prosecuted."